Annette and I are in an Internet cafe right now while Will is with her parents/his grandparents/ my inlaws, which is the reason why we came to Mittenwald in the first place. And by “Internet cafe” I really mean “bar,” one that features a bunch of different kinds of games and stuff, inclduing Internet access. Nice computers, though again, a sort of weird interface. The “z” is where the “y” should be. We left Florence on Saturday in a bit of confusion (is that our train? really? ), but it all worked out to a lovely but relatively boring train trip to Innsbruck, where we met Annette’s parents, and then Mittenwald. 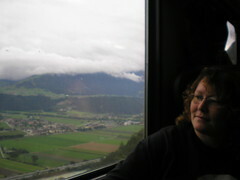 Here’s Will in Florence; here’s Annette on the train from Innsbruck to Mittenwald, which featured lovely (albeit somewhat scary) mountain views. Mittenwald is a lovely and VERY German kinda town– people wandering around in lederhosen and the whole 10 yards. It is the kind of tourist town the Germans go to when they want to experience something really REALLY German. 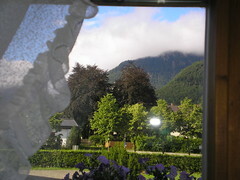 Here’s a view from the room, Will and Annette on the balcony, walking through town, and mountains with painted houses in the foreground. Oh, and me and Will in a Cafe. There’s much more to tell, but right now, Annette and I need to go meet the Grand-Ps and kinder for dinner. More later…. Happy travels! Love the updates. WOW, does that look fabulous! I hope it’s as spectacular as it seems. And remember… no liquids on those airplanes coming home! Previous PostPrevious As we leave Italy….